A condominium is more than just a residence. It is a community of individuals who, because they share ownership of common property, must work together to ensure that the value of that property holds and the quality of life in their community remains high. Condominium owners’ common interests require that residents and the leaders who serve them meet regularly to discuss how best to manage and maintain the property. In fact, Florida law closely regulates condominium association meetings, including such details as how often they must be held, how participants must be notified, and how business must be conducted. The complex rules that regulate meetings of condominium association boards, unit owners, and committees can be daunting even to experienced association leaders. That’s one reason why “Conducting Meetings” is such a valuable course for all condominium owners. In clear, direct language, the course teaches association leaders and condominium residents not only the many state regulations they must comply with but also strategies for conducting effective, productive meetings that help to build well-managed condominium communities (Discounts are available for Condominium Boards or Property Management Companies by calling us at 1-800-521-9667). Directors, Officers, and Managers of condominium and homeowners’ associations. 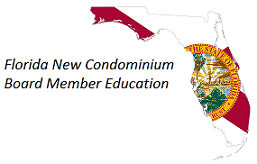 To instruct Directors, Officers, and managers of condominium and homeowners’ associations in how to conduct effective and productive meetings that satisfy the requirements of the Florida statutes governing condominiums. set up, plan, and conduct condominium association committee and budget meetings in a manner consistent with applicable statutes and condominium association bylaws. This course (# 9626082) has been approved for 2.00 hours of continuing education credit in the areas of HR or ELECTIVES (ONLINE) by the Regulatory Council of Community Association Managers of the Florida Department of Business and Professional Regulation. For more information about continuing education for Community Association Managers, visit the Regulatory Council's homepage.